Hello! I couldn't think of a snappy title today. 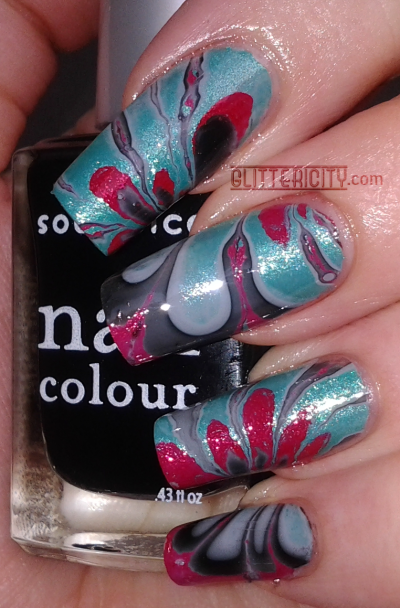 I'm actually not feeling very chatty at all... but I do have a new nail design to show you. 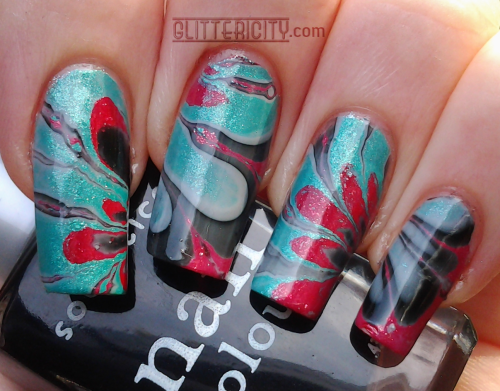 I love water marbling, but I always tend to go for the same type of look--three shades of the same finish, random marble pattern. 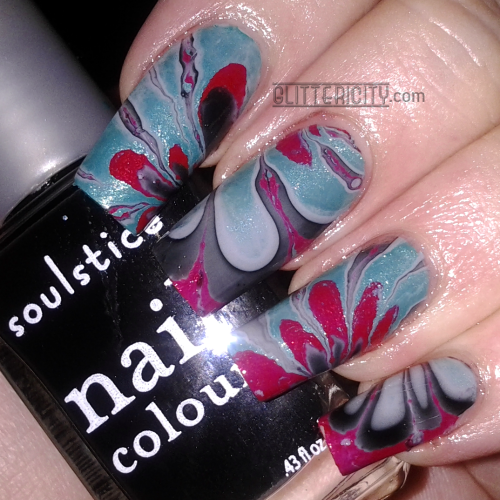 To step outside of this rut, I decided to do a 4-colour, 2-finish, flower-shaped marble with two of my favourite brands--Zoya and Soulstice Spa. It's quite simple, really... 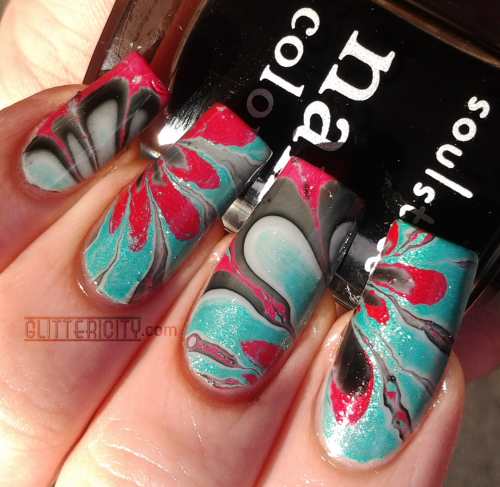 The cremes are Soulstice Spa Gotham (black) and Manchester (grey), and the shimmers are Zoya Zuza (teal) and Nidhi (red). Manchester served as the base shade, being the lightest of the bunch. 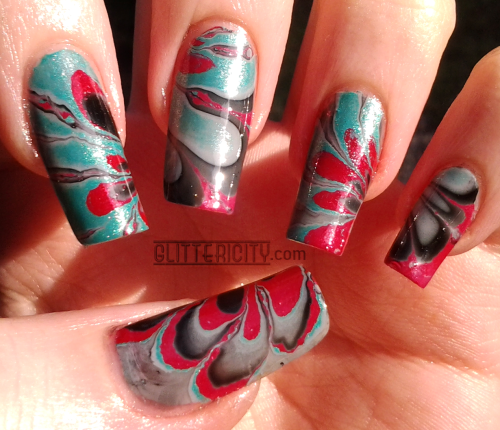 Cult Nails Wicked Fast topcoat sealed it all in. The shimmers are really more glassflecky than traditional small even shimmers, and I think that's what caused the wobbly lines. I didn't expect it, but I think it looks pretty cool! 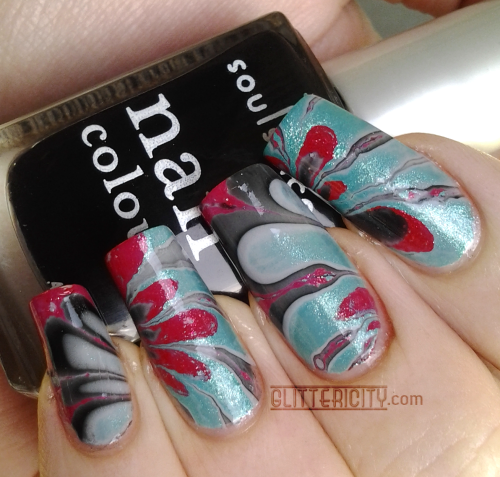 I really like how the black and grey looks on the small nail (even if the topcoat did smear it a bit... oops). Outdoors in sun. The thumb looked nice except for that weird bit near the base. I think they merged in the water and I didn't notice. Once more with feeling flash.